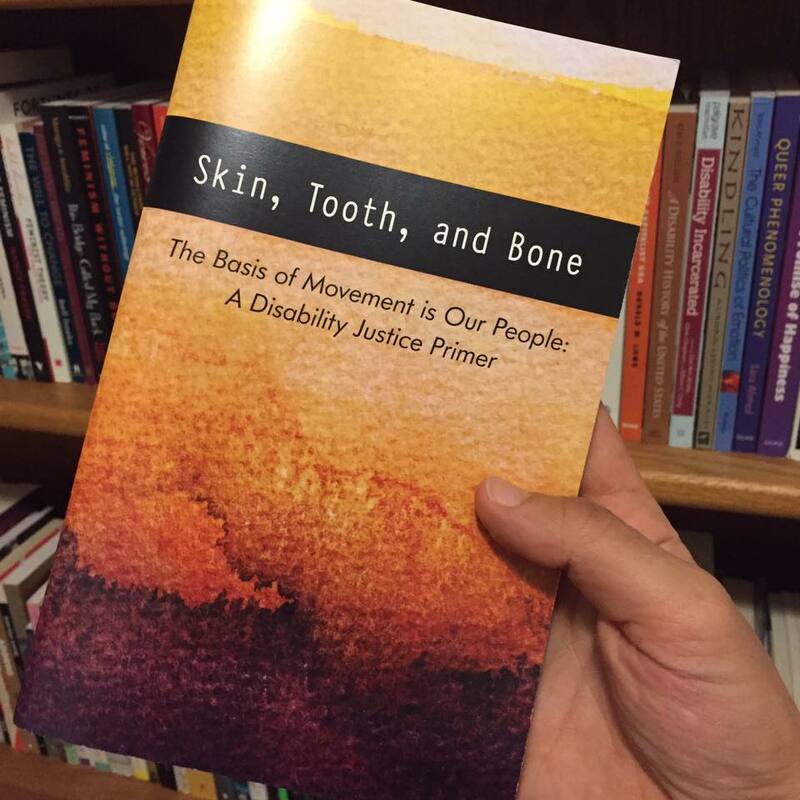 The following is an excerpt from Skin, Tooth, and Bone, a primer on disability justice written by Sins Invalid. We are excited to share our writing with the Kindle Project community. Although this excerpt, entitled “Disability Justice: A Working Draft”, was published within the primer in 2016, the issues it addresses remains ever relevant. We observe profound ableism within society most broadly yet also in our activist, organizing, social justice spaces. At the macro level, the current United States administration has proven to be actively hostile, enacting violence towards disabled people. These scenarios evidence the growing necessity of disability justice for our collective liberation. In recent years, on websites and new media locales, on flyers and in informal conversations, I’ve witnessed people add the word “justice” onto virtually everything disability related — from disability rights based services and access audits to disability scholarship — while doing nothing to shift either process or end goal, thinking that the word change alone brings that work into alignment with disability justice. Not so. What follows is a working draft definition of disability justice, a living document that will grow and change along with our emergent movement. It marks a point of departure rather than a destination, and an invitation for those of us living an engagement in disability justice to continue to support one another to find a language as powerful and expansive as our movement’s visionary praxis. There was phenomenal and historic work to develop the disability rights movement in the U.S., and it had many successes in advancing a philosophy of independent living and opening possibilities for people with disabilities through the establishment of civil rights for people with disabilities. Like other movements, the current disability rights movement includes advocacy organizations, service provision agencies, constituency led centers, membership based national organizations, as well as cultural and academic spaces. privilege is leveraged at differing times and for various purposes; it centers people with mobility impairments, marginalizing other forms of impairment; and centers people who can achieve rights and access through a legal or rights-based framework. The political strategy of the disability rights movement relied on litigation and the establishment of a disability bureaucratic sector at the expense of developing a broad-based popular movement. While a concrete and radical move forward toward justice, the disability rights movement simultaneously invisibilized the lives of peoples who lived at intersecting junctures of oppression – disabled people of color, immigrants with disabilities, queers with disabilities, trans and gender non-conforming people with disabilities, people with disabilities who are houseless, people with disabilities who are incarcerated, people with disabilities who have had their ancestral lands stolen, amongst others. In response to this, in 2005, disabled activists of color, originally queer women of color incubated in progressive and radical movements that did not systematically address ableism – namely, myself, Mia Mingus, and Stacey Milbern, soon to be joined by Leroy Moore, Eli Clare and Sebastian Margaret – began discussing a “second wave” of disability rights and ultimately launched a framework we called Disability Justice. Given the isolation enforced by ableism and classed boundaries, many of us have often found ourselves as agents of change from within our respective communities and isolated from in- person community with other disabled people of color or queer or gender non-conforming crips, finding “liberated zones” instead online. In many ways, Disability Justice is a nascent framework that some call a movement, still identifying the “we” – sometimes in fluid spaces and sometimes in each others’ hoped and spoken words, touching each other through the echoes of those we mentor close by. Given this early historical snapshot, I assert that Disability Justice work is largely done by individuals within their respective settings, with Sins Invalid, the NYC-based Disability Justice Collective, Seattle’s Disability Justice Collective, and Vancouver’s Disability Justice Collective being notable exceptions. Some voices may emphasize a particular component of the framework over another, as can be expected in early movement moments. However, what has been consistent is the leadership of disabled people of color and of queer and gender non-conforming disabled people. A Disability Justice framework understands that all bodies are unique and essential, that all bodies have strengths and needs that must be met. We know that we are powerful not despite the complexities of our bodies, but because of them. We understand that all bodies are caught in these bindings of ability, race, gender, sexuality, class, nation state and imperialism, and that we cannot separate them. These are the positions from where we struggle. We are in a global system that is incompatible with life. There is no way stop a single gear in motion — we must dismantle this machine. Disability Justice holds a vision born out of collective struggle, drawing upon the legacies of cultural and spiritual resistance within a thousand underground paths, igniting small persistent fires of rebellion in everyday life. Disabled people of the global majority — black and brown people — share common ground confronting and subverting colonial powers in our struggle for life and justice. There has always been resistance to all forms of oppression, as we know through our bones that there have simultaneously been disabled people visioning a world where we flourish, that values and celebrates us in all our myriad beauty. be a site of privilege or oppression. The fulcrums of oppression shift depending upon the characteristics of any given institutional or interpersonal interaction; the very understanding of disability experience itself being shaped by race, gender, class, gender expression, historical moment, relationship to colonization and more. Referenced earlier, the second principle is the Leadership of Those Most Impacted. It reflects our understanding of ableism in the context of other historical systemic oppressions, thus we are led by those who most know these systems. Like the above principles, Disability Justice shares two additional principles with other justice-based movements — an Anti-Capitalist Politic and a Commitment to Cross Movement Organizing. We are anti-capitalist as the very nature of our mind/bodies resists conforming to a capitalist “normative” productive standard, with the actual construction of “disability” derived from the exploitation of the body in an economy that sees land and human as components of profit, deriding the integrity of our very real crip labor. Necessarily cross movement, Disability Justice shifts how social justice movements understand disability and contextualize ableism, lending itself toward a united front politic. Sixth is the cripped principle of Sustainability, that we value the teachings of our lives and understand that our embodied experience as a critical guide and reference pointing us toward justice and liberation. Seventh we hold a Commitment to Cross Disability Solidarity, valuing and honoring the insights and participation of all of our community members and therefore are committed to breaking down ableist / patriarchal / racist / classed isolation between people with physical impairments, people who identify as “sick”or are chronically ill, “psych” survivors and those who identify as “crazy”, neurodiverse people, people with cognitive impairments, people who are a sensory minority, as we understand that isolation ultimately undermines collective liberation. Eighth we have an awareness of Interdependence, as we were taught before the massive colonial project of Western European expansion. The disability rights call for independence pried disabled people from systems of patronage and being spoken for and about, in companion to the ideas of self-determination and community. From this starting point, we can widen and deepen our analysis, as this state was never set up to serve brown and black people. We can see the liberation of all living systems and the land as integral to the liberation of our own communities, as we are all share one planet. We can attempt to meet each others’ needs as we build toward liberation, without always reaching for state solutions which inevitably then extends its control further over our lives. function differently in various environments. Access needs can be articulated within a community and met privately or through a collective, depending upon an individual’s needs, desires, and the capacity of the group. We can share responsibility for our access needs without shame, we can ask our needs be met without compromising our integrity, we can balance autonomy while being in community, we can be unafraid of our vulnerabilities knowing our strengths are respected. Lastly, the tenth principle is the path and goal of Collective Liberation, in which we hold the question “How do we move together” – as people with mixed abilities, multiracial, multi-gendered, mixed class, across the orientation spectrum – where no body/mind is left behind. This is Disability Justice, an honoring of the longstanding legacies of resilience and resistance which are the inheritance of all of us whose bodies or minds will not conform. Disability Justice is a vision and practice of a yet-to-be, a map that we create with our ancestors and our great grandchildren onward, in the width and depth of our multiplicities and histories, a movement towards a world in which every body and mind is known as beautiful.